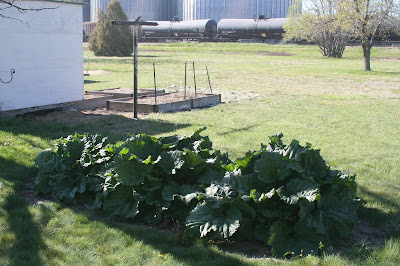 Thirty-plus years ago when I moved to Colorado, my mini high-plains acreage came with three rhubarb plants. 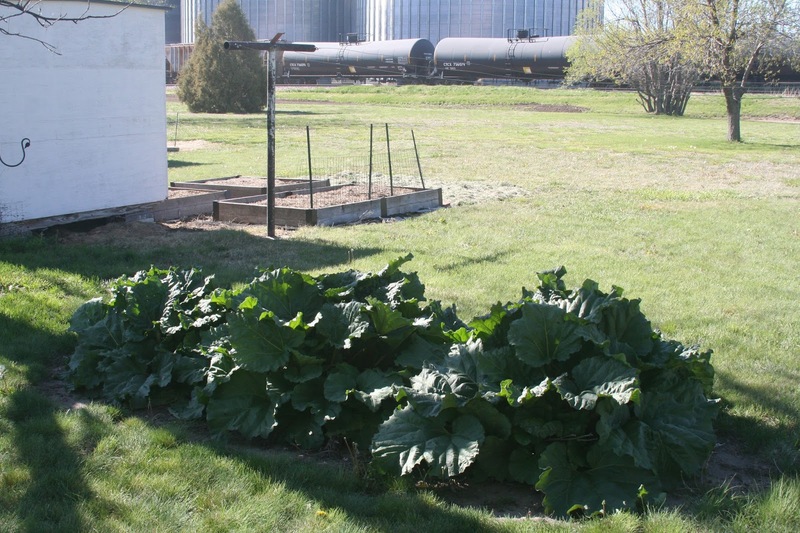 Rhubarb fell somewhere between liver and homony in my less-than-fond childhood food memories, so the first six or seven summers I watched these plants go to seed and mowed them down when the leaves began to fade from neglect by fall. It proved a forgiving plant, however, and returned each spring, green and lovely as ever. The waste of these plants, not really a fruit, but often considered one, continued until one fall when I attended a Phillips County Fair Queen lunch as part of my duties as a reporter for one of our county’s two community newspapers. The fair queen that year happened to be Jodi Starkebaum, the granddaughter of Phyllis (Anderson) Starkebaum, a wonderful, gentle-speaking woman who went off to college, returned to the area, spent one year as a teacher then dedicated the remainder of her life to working beside her husband Loren on their farm and caring for her home and family. While I do not know this for fact, I believe that Phyllis found bliss in her role as farm wife, mother, grandmother and friend to many. The dessert served with the fair queen lunch that day, a red-sauced concoction with a toasted crumb topping, sent my taste buds to subliminal paradise. “What is this?” I asked one of the attendants as she passed my chair re-filling glasses from a pitcher of iced tea. “I’m not sure,” she said, but agreed to find out, and a short time later I learned that it was called “Rhubarb Dessert,” a delicacy made by the queen’s grandmother. “This is rhubarb?” I asked in astonishment, and suddenly mourned all of the rhubarb I wasted over the years. I went directly to Phyllis, who agreed to send me the recipe, and I have been making it every since. My brother Phil found yet another use for my rhubarb that eventually made its mark on our county the fair. One year Phil came to me asking for rhubarb to make wine. Why not? I thought and sent him out back with the cutting shears. Phil made a five-gallon jug of this lovely clear, sweet liquid, bottled it and gave me two bottles. I drank one, complimented him on a job well done and decided to hoard the other for a special occasion. That special occasion never came and the second bottle remained in my cupboard when Phil died in 2001. I could not bring myself to drink it. A few years later, however, I decided to enter it in our county fair’s winemaking contest in his name. It won first place and “Best over all.” The judges loved it. So much so that they sent me home with the prize, a pair of gold-trimmed wine glasses, and an empty bottle. I still imagine Phil smiling when his name in the list of winners printed in our local newspapers that year. The wine glasses remain in my china hutch. I may use them if I ever make rhubarb wine. I was reminded of Phyllis and her Rhubarb Dessert this past weekend when my friend Faye came for a visit. Faye and I met as young girls, back when our dad’s hung out at the old North Sante Fe beer joint in Salina, Kansas. Out of respect for her and the possibility that she does not want her age reported over the Internet, I won’t say how long ago that was, but suffice to say we have known each other many years and have been friends for nearly all of those years. Since the rhubarb was ready for picking, I suggested that we put up some Strawberry-Rhubarb Jam. Faye, always open to a new adventure, agreed. Thus, that first day of her visit found her cleaning and slicing strawberries while I diced the rhubarb stalks that we picked early that morning. 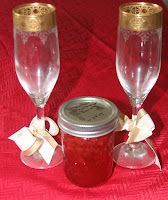 We laughed the time away, enjoying each other’s company, the canning seeming more fun than work. We ended up with a dozen lovely jars of jam and the warm feeling that comes from a lasting friendship that, like a hardy rhubarb plant, seems to thrive no matter what life brings. And, yes, we picked enough rhubarb to make Phyllis Starkebaum’s dessert, which we shared at church the following morning. 1. Spread chopped rhubarb in bottom of 9-inch square pan and sprinkle ½ of the sugar over fruit. 2. In bowl, mix remaining cup of sugar, flour and baking powder. 4. Drop in the egg and dash of salt. 5. Mix until dough clings together then drop by spoonsful onto top of rhubarb. 6. Bake at 350°F for 45-50 minutes until nicely browned. 7. Serve at room temperature with a dab of whipped topping or a scoop of ice cream. Note: I tried making this topping with butter, but found that margarine works best. What a wonderful tribute! G'ma's (Phyllis) desert continues to be a family favorite. In fact, I just chopped and froze 10 quarts last night that our neighbors Tom and Corrina Wilson thoughtfully dropped off yesterday. I have one quart ready to make the rhubarb dessert yet this afternoon. I'm glad others love it as much as we do. Thanks for your comment, Cathy. Phyllis left a lasting impression on me for many things in addition to her rhubarb dessert. We had some wonderful conversations over the years.